Krishnabhumi » Why Vrindavan Celebrates Jagannath Rath Yatra? Why Vrindavan Celebrates Jagannath Rath Yatra? Rath Yatra, the Festival of Chariots, is celebrated for many years in Puri with grandeur, enthusiasm, fanfare, elaboration and religious fervour. In Vrindavan, simplicity sets the tone for this auspicious day. If you are in Vrindavan during Rath Yatra, you can be a part of a wonderful experience when the beautiful chariots come out in the streets in a lavish procession, from the many temples here. The experience is delightful when these chariots circumambulate Gyan Gudri. The major attractions are the chariots from the three ancient temples of Gopinath, Govinda and Madan Mohan and also the temples at Jagannath Ghat, Vishram Ghat and Sadhu Mai Ka Ashram. It’s not simply about Rath Yatra celebration in Vrindavan. There is more to the story than it meets the eyes. 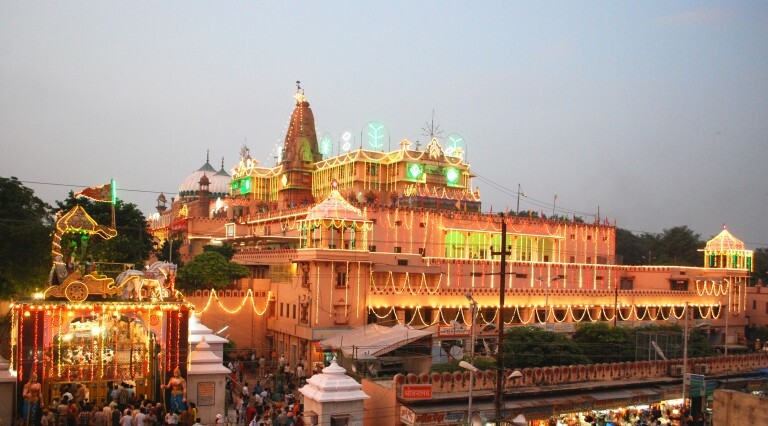 Many people are unaware of the meaning of Rath Yatra and its significance in Vrindavan. Do you know why all the chariots meet at Gyan Gudri? Let us tell you this beautiful story. 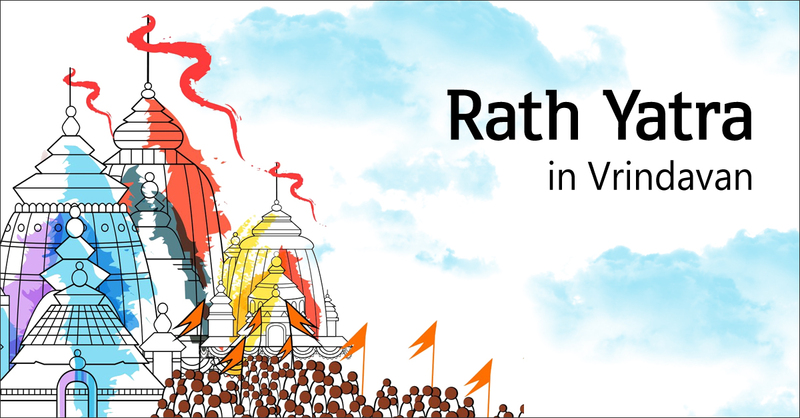 We spoke to many scholars and acharyas who narrated the story behind Rath Yatra in the holy Vraj. According to them, after the Mughal emperor Aurangzeb raided Vrindavan, the idols of Gopinath, Madan Mohan and Govinda were moved to India’s Pink City, Jaipur. As a result, the original temples had no deity. And so the acharyas of that period decided to place the idols of Jagannath in those empty temples. 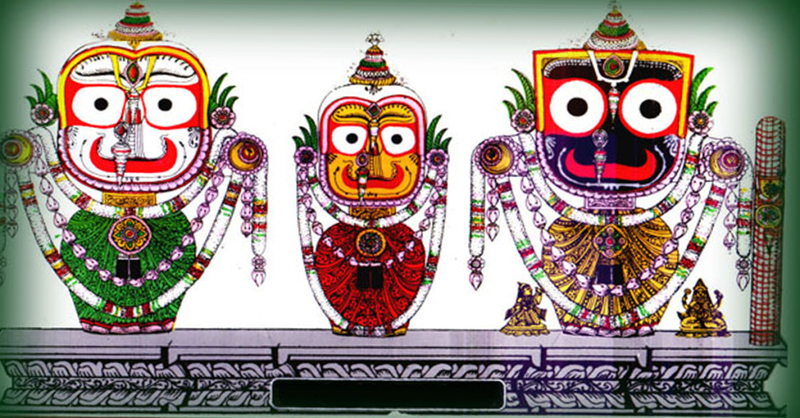 Once the new temples of Gopinath, Madan Mohan and Govinda were built and the replicas placed, Lord Jagannath’s deity was also set up in the new temples. 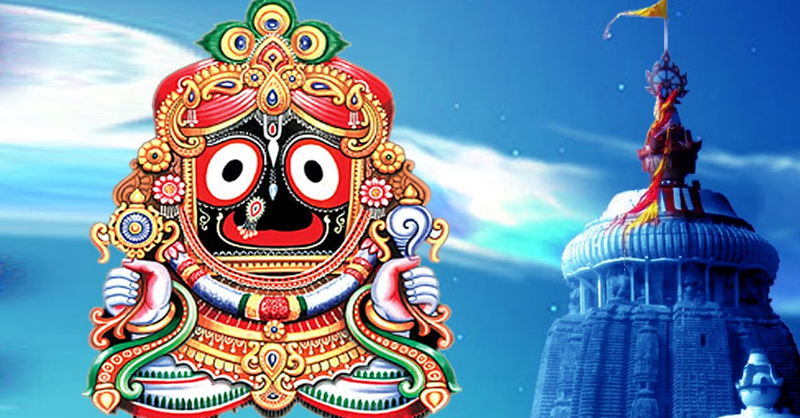 Since the idol of Jagannath was in the temple, it was necessary to take the Lord out on Rath Yatra. According to the archaryas, the ideal place for Rath Yatra was Gyan Gudri, where Sri Uddhava, one of Shri Krishna’s disciples, heard about the Divine love from the Vraja Gopis or damsels. Lord Krishna’s Rath Yatra is also held in Vrindavan along with Jagannath. 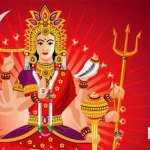 This festival is related to the Gopis’ divine love for Devakinandan. Shri Krishna rode a chariot for the very first time in the holy land of Vrindavan. 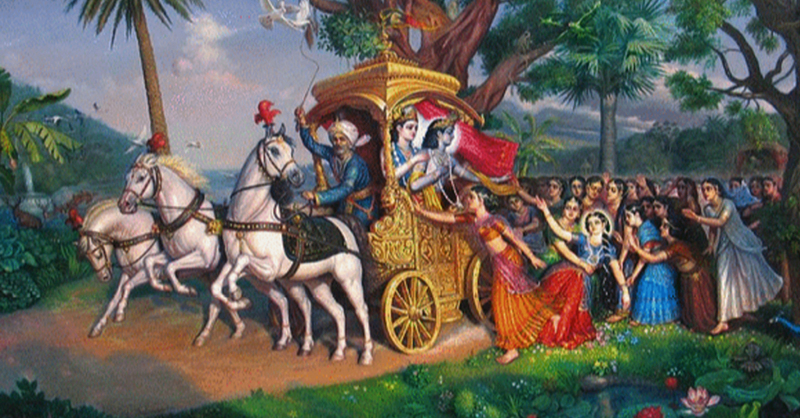 This chariot was sent by Krishna’s uncle King Kamsa to transfer Devakinandan and Balaram to Mathura. 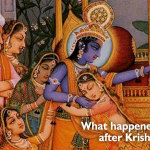 The separation from Vrindavan made Krishna take Jagannath’s form. 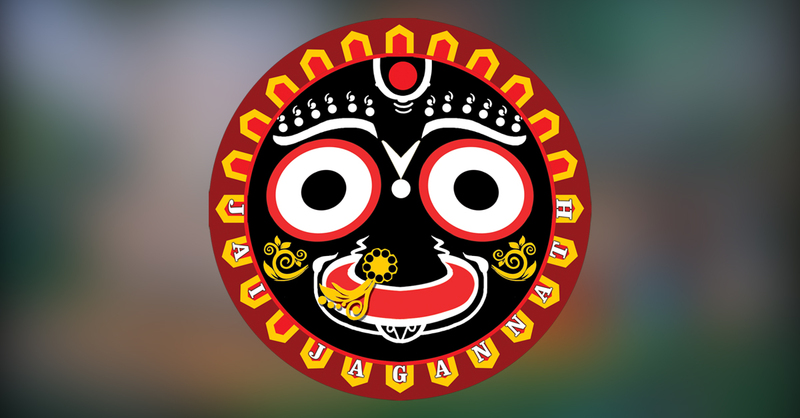 The Utkala Khanda of the Skanda Purana tells the story of Krishna’s manifestation as Jagannath. During a solar eclipse, Devakinandan, Balaram, Subhadra and Dwarka’s other residents went to take a holy dip in a pond at Kurukshetra. Lord Krishna’s parents Nanda and Yashoda, Radha and the other residents of Vrindavan were burning due to the separation from Hari, another name for the Lord. Knowing about Shri Krishna’s whereabouts, they all went to meet Devakinandan. Balaram’s mother Rohini Ma spoke to Krishna’s wives in Dwarka about His favourite pastimes in Vrindavan and the Gopi’s divine love for Him. Rohini’s narrative was kept exceedingly confidential. 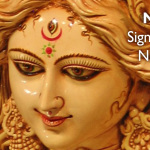 That’s why she posted Subhadra near the door so that no one could enter the premises. Realising that Rohini Ma was talking about Him, Devakinandan and Balaram came close to the door, standing on Subhadra’s left and right sides. Lord Krishna stood listening along with Balaram. Hearing of these stories, Devakinandan was overcome with strong feelings of separation from the holy land of Vrindavan. Shri Krishna was so fascinated hearing about His pastimes in Vrindavan that His heart started melting. Both Devakinandan and Balaram were so overjoyed that their inner feelings manifested outwardly. Their eyes were dilated, heads pressed together into their bodies and their limbs drawn back. Witnessing these physical transformations in Krishna and Balaram, Subhadra too felt euphoric and took the same form. 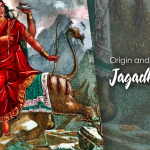 After hearing about Krishna’s pastime in Vrindavan, Devakinandan and Balaram with Subhadra in the middle unveiled their ecstatic form and it is this form that is worshipped as Lord Jagannath, Balaram, and Subhadra in Puri. After Shri Krishna, Jagannath and Subhadra returned to their normal forms, and Devakinandan recovered completely, Krishna realised that it was Narada’s trick because he planted the idea in Rohini’s mind to narrate the story of Krishna’s pastime in Vrindavan. Though Narada Muni thought that his doing will make Krishna angry, but to Narada’s relief, Shri Krishna was pleased with him. In fact, the Lord wanted to shower His blessings on Narada Muni. Narada prayed to Krishna, Balaram and Subhadra to appear in those forms at some place in the world to give Darshan to their devotees. The special form is also called ‘Patita Pavana’, the rescuer of the fallen and liberator of the universe. This is why Shri Krishna welcomed Narada’s wish to give Darshan to His devotees as ‘Jagannath’ in Puri. The separation of Shri Krishna from Vrindavan made Him take Lord Jagannath’s form. Though we associate Rath Yatra with Puri, the holy festival has its roots deeply seated in Vrindavan, where Shri Krishna had His favourite pastimes. Come, be a part of this holy land and experience the magic called Vrindavan through a Krishnabhumi Holydays membership.